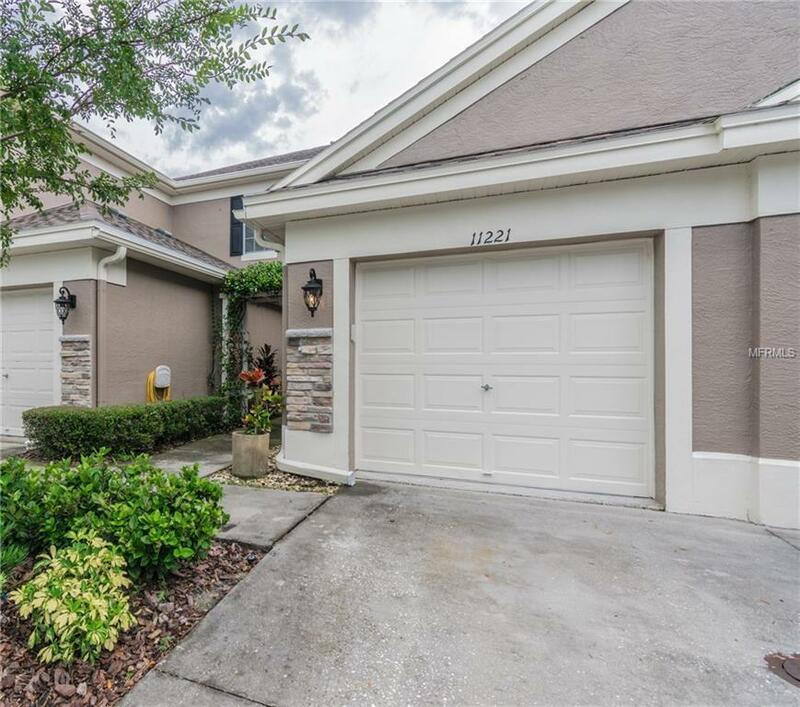 Wonderful townhome at Windsor Place, in the highly desirable area of Westchase. This unit has 2 bedrooms and 2 full bathrooms and 1 half bath with an attached 1 car garage. New roof and fresh outdoor paint, move-in ready condition and immaculately cleaned. As you walk into the entrance you will find well manicured landscape and a lovely trellis leading you to the front door. Inside the unit you will see the spacious kitchen with lots of counter space, wood cabinetry, pantry and a nook area. There is also a counter bar for extra sitting space. The dining and living room area are opened and share the space with views to the kitchen and outside. The large sliding doors lead you to the screened porch, which adds a great space for outdoor cooking or relaxation. Downstairs is a powder room for your guests convenience. The unit has upgraded and modern lighting features. The window treatments will convey. Upstairs you will find nice bamboo floors throughout. The large master bedroom has lots of windows, great for sunlight, it features high vaulted ceilings and an on-suite master bath with slate tiles. The second bedroom is next to the second full bathroom. There is a washer and dryer conveniently located upstairs, and a linen closet. Low HOA of $130, community pool, close proximity to restaurants and supermarkets, to the library and a short commute to the airport, downtown Tampa and the most beautiful beaches in the nation. HOME WARRANTY INCLUDED, WOW!!! Don't wait on this one, make it your new home. Additional Lease Restrictions Hoa Will Not Allowed Short Term Leases If A Tenant Breaks Lease Before Expiration Date Hoa Will Not Allow Owner To Lease Unit Again Until That Current Lease Expires. Have Buyer inquire Hoa About This if They Are Looking To Make it A Rental. Pet Restrictions Call Hoa For Pet Restrictions 727-787-3461.